Coral seems to be the going colour this year. These ladies are ready for a night out in Monte Carlo. 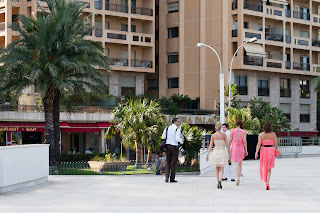 They are walking across the forecourt in front of the Grimaldi Forum on Avenue Princesse Grace. I hope they do not have a long walk in those shoes. I bet they don't end up in a drunken stupor on the pavement like some girls do on a Friday and Saturday night! Marc Quinn at the Oceanographic Museum - Fire!